Social networking services (SNS) such as Friendster and MySpace are evidence of the popularity of interacting with like-minded people online, but none can be as cutesy as the new mobile-phone SNS from Disney Japan. The newly launched Wonder Days service is available on the official menus of the mobile internet services provided by all three major Japanese carriers, including DoCoMo’s heavy-hitting iMode. The idea is to build an avatar that can be used to explore the environment provided by Disney. 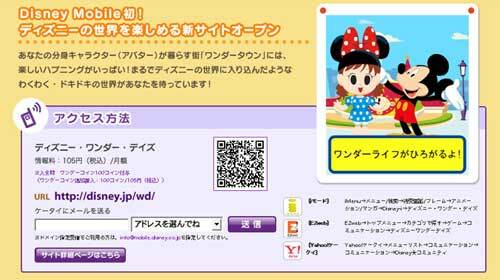 For ¥105 a month users get to participate in various Disney-themed games in the virtual world, interact with other users and modify their avatars with new clothing and other accessories. While it may seem that such a service should be aimed at school-age children, it’s likely to find more of a market among 20- and 30-something Japanese women. In a nation obsessed with all things cute, the Disney brand is king, with two Disney resorts just outside Tokyo holding particularly dear spots in the collective heart. For a closer look at the new service and several similar products in action on a real Japanese phone, there’s an excellent video report available here from our pals at Wireless Watch Japan. Incidentally, eagle-eyed readers looking at the Wonder Days page may notice the presence of a QR Code for launching the site on a phone – we wonder how much use it will see.